The countdown is over. Andrew Lincoln’s time as the face of The Walking Dead came to an emotional end in the latest episode. Rick Grimes might be gone from the franchise’s flagship program, but he isn’t going far. 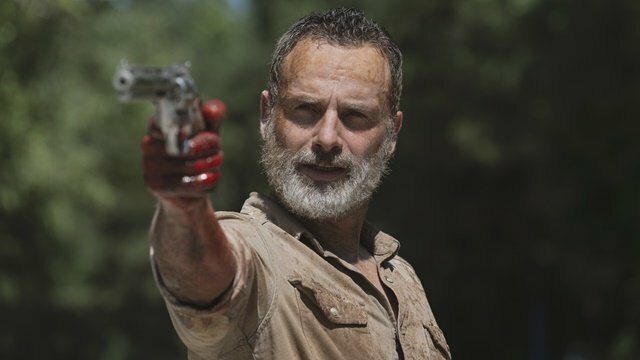 Even with a trilogy of Rick Grimes’ focused films on the horizon, AMC still delivered an episode worthy of sending off a figure of his importance. It goes without saying that Rick Grimes’ final episode focused heavily on the now wounded leader. He’s able to escape both the enclosing walker herds and his rebar skewer. But he isn’t able to escape his own delirium, which sends him through a flurry of hallucinations. He shares a burger with Shane at the scene of Rick’s shooting back in Georgia. Rick expresses the need to find his family, leading Shane to ask about Judith. Shane takes credit for creating Rick’s vengeful side, imploring him to find the rage that drove him to bite out a man’s throat. Rick comes to just in time to escape a walker’s lunge. 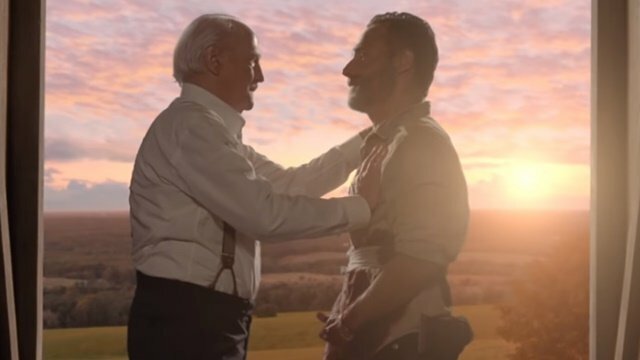 He later finds himself speaking to Herschel in his barn.The two look out over the farm, the setting sun as a backdrop, as Rick apologizes for his death. Herschel is quick to correct him, pointing out how he helped strengthen both him and Maggie. Rick reiterates the need to find his family, but Herschel assures him that he doesn’t need to keep them together anymore. The warm moment ends, leaving Rick among the undead once again. Speaking of Maggie, she is dead set on ending Negan’s life. She arrives at Alexandria to find Michonne standing between her and her vengeance. Michonne’s efforts to convince her otherwise fall on deaf ears as Maggie points out that Negan would already be dead if Rick fell victim to Lucille instead of Glenn. Michonne hands Maggie the keys to Negan’s cell and stands down. Negan immediately begins provoking Maggie as she demands he get on his knees. His attempts to push Maggie closer to her crowbar-defined justice work fairly well, reliving his murder of Glenn in gruesome detail. 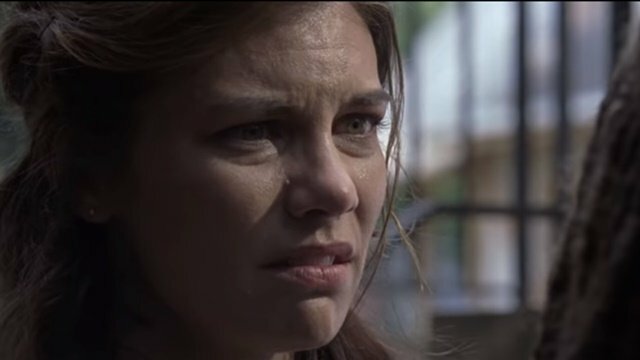 Maggie unlocks the cell and casts Negan into the light, revealing his disheveled state. Negan begs her to kill him so he can be with his wife and Lucille, repeating that he’s supposed to be dead. Maggie demands he get back in his cell, declaring him worse than dead. Rick’s hallucinations continue, planting him among a sea of the dead. Rick recognizes some of the faces among the mass as Sasha appears behind him. His shock is met with comfort from her, explaining that Rick did his part in advancing the collective’s efforts. She speaks of how he gave them strength, helping everyone make each other better. She tells Rick that he won’t find his family because they, just like him, aren’t lost. Rick wakes up at the base camp near the bridge where new walkers, courtesy of the earlier gunfight, emerge. Rick begins leading the herd across the bridge, believing it will break under their weight. The bridge holds, a fact that would otherwise delight Rick. Walkers bear down on him as his crew, led by Michonne and Daryl, rush into action. Michonne implores Rick to not give up and fight for the community he worked so hard to build. Rick smiles, realizing both that he found his family and that he is hallucinating. In reality, Rick is alone. That quickly changes when his family appears. Daryl’s crossbow fends off walkers as the Michonne rushes to the bridge to stop Rick from destroying the bridge. She rushes through the woods as Rick takes aim at a copious amount of dynamite. As everyone looks on, Rick destroys the bridge in a massive explosion. Flaming undead careen into the rushing river as Michonne weeps and a tearful Daryl walks away alone. Anne waits for the mysterious voice on her radio to arrive at a clearing when she notices Rick, still alive, washed up on the river bank. She rushes to him, informing the incoming chopper that she has a “B.” She implores the mystery figure that she’s is trying to save a friend. Her pleas work, as she and Rick fly away in the chopper. A great amount of time passes before a group of young survivors begin fending off a group of walkers near the chopper’s last location. The group is saved by a shooter in the woods. 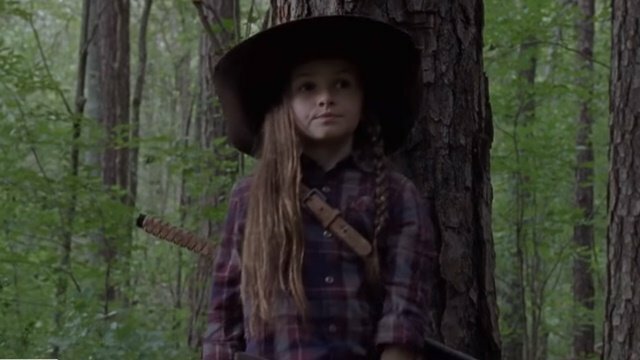 The group find their savior, Judith Grimes, as she prepares to ask them three questions. What did you think about The Walking Dead season 9 episode 5? Let us know in the comment section below!